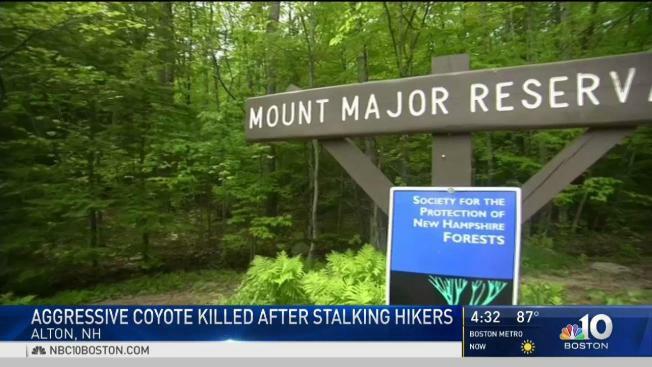 A coyote was shot dead after it charged at several people at a popular hiking spot in New Hampshire. It was a nerve-wracking few days for hikers on Mt. Major in Alton, New Hampshire this week as authorities warned of an aggressive coyote. By Thursday evening the animal, believed to be rabid, was shot and killed by a New Hampshire Fish and Game official. For the first time in his decade-long career, Conservation Officer Ron Arsenault came face to face with a charging coyote. He immediately fired his shotgun and put it down. Arsenault said the calls started Wednesday morning. Hikers were reporting an aggressive coyote tormenting them on the Yellow Trail. One caller reported that the animal had attacked her dog. “You see coyotes and deer and porcupines all the time, but this is the first time we ever heard of anything attacking anybody,” said Alton resident Joe Torriero. Hikers from out of town were left a bit unsettled after hearing the story and seeing this picture. “That really freaks me out,” said Shannon Conway of Belmont, NH. “That’s terrifying,” said Stacia Glover of Franklin, NH. Arsenault says he’s just thankful he caught up with the coyote before Friday when 200 high school kids from Sanford, ME showed up for a field trip. “I’m glad we didn’t come yesterday,” said Sanford High Teacher Diana Walker. And while most people fully expect to encounter wildlife in the New Hampshire woods, few people are prepared for those animals to come at them. “I really have no idea,” Torriero said. Officer Arsenault says if you encounter a rabid animal, use a stick or rock to try and fend it off and then get as far away from the animal as possible.